Cloth size 50m x 30cm. TIDDOX makes a roll of PREMIUM HEAVY DUTY ROLLS that you can use for tough stains and messes in kitchens, dining areas, hospitality venues, aged care and childcare facilities. These premium, heavy duty cloths are thicker and heavier than Medium Duty Cloths, and also are treated with an antibacterial agent to last longer by inhibiting bacterial growth, which makes them invaluable in cleaning up patients, toddlers, or the aged. Above all, they are manufactured with extraordinarily high levels of viscose for greater absorbency to soak up the toughest cleaning demands. Any general purpose wiper worth using needs to be absorbent. That means you can use it to soak up fluids and semi-fluids and it won’t leave a streak behind. These heavy-weight wipers will soak up a spill and hold the fluid in its fibers. You will be able to walk to the garbage bin or hazardous medical waste container and drop the cloth and its contents in. And, the cloth shouldn’t come apart or drip all the way, unless it is severely overloaded..
Viscosity is the rating given liquids that reflects how “liquid” it is. Gel has a higher viscosity than liquid. Blood has a higher viscosity than water, feces has a higher viscosity than urine. These premium heavy-duty wipers have a high viscosity rating. This means that you can use them in healthcare or medical situations in which you need to contain bodily fluids that could otherwise create a health hazard. The fact that these cloths have an antibacterial agent in them makes them even more valuable! These slightly bigger towels will not only hold more because of their size, they are thicker, too. That means they will soak up more fluids than the average towel by comparison. 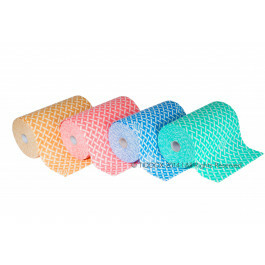 Each 45 meter roll contains 90 perforated wipes, measuring 50cm X 30cm. Each extra absorbent wiper can hold more volume of liquids and semi-liquids. Its viscosity rating is better, too, so it will actually absorb many gels and semi-solids, rather than smearing them around. This makes for a product that is in high demand with healthcare and medical facilities, as well as the hospitality industry. The heavy duty cloths are perforated on the roll to make it easier to tear them free. And since they are so heavy weight customers tend to use these cloths more than once which extends the life of the towels. They are available in green, red, blue, and coffee color, which makes it much easier to color-code them for specific uses. Since these PREMIUM HEAVY DUTY ROLLS are available in several different colors, we have customers who order multiple colors for coding. Our hospitality customers will use green in the kitchen, blue in housekeeping, and coffee behind the bar. It’s up to you! Your order of our PREMIUM HEAVY DUTY ROLLS will have 4 rolls in the carton. This gives you the option of placing a roll in each of the places they are needed most. Being multi-purpose, these PREMIUM HEAVY DUTY ROLLS are used in a variety of industries, including the Hospitality sector and the Healthcare industry. Pubs, clubs, restaurants, hotels and catering businesses use huge volumes of these surface wipes in the back of house kitchens as well as in the front of house serving areas to keep tables and counters clean, and to absorb unexpected spills. They are favoured because by bulk packaging the wipes on a roll, reduces the average cost per wiper substantially. However, in efforts to reduce the cost, many manufacturer's have compromised on quality by reducing weight or viscose content, both of which impact on the absorbency of the cloth, and using an under performing low quality, cheap wiper impacts productivity and costs more in the long run. So by choosing a quality brand like the TIDDOX HOSPITALITY PREMIUM WIPES ON A ROLL you can rest assured that you will be buying a quality wiper, with extra thickness and very highly levels of viscose for optimal absorbency and performance! TIDDOX's HEALTHCARE HEAVY DUTY WIPES ROLLS are used in childcare and aged care organisations, as well as in hospitals and other healthcare facilities. The fact that they are disposable is important in maintaining hygiene, and so through the act of disposing of a cloth after use, any contamination or germs picked up by that cloth are effectively disposed with it too. Again the thickness and viscose content of the TIDDOX rolls makes them suitable for heavy duty tasks, and their added strength and thickness ensures that they will not fall apart easily during use. Obviously the added feature of the antibacterial agent also helps extend the life of the cloth reducing costs and hygiene risks.